At Piscine 2010 in Lyon, Bio-UV has underscored its excellent market position with regard to environmental sustainability, by its presence in the Pool Eco Attitude section. 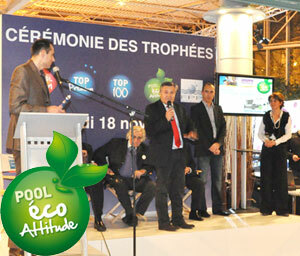 The company received one of the 9 POOL ECO ATTITUDE Trophies, awarded during the Lyon's Show, for its DECHLORAMINATORS AND UV RANGE, in the category of "Water treatment". New applications for wastewater and pollution control are expected in the next few years, to enhance the company’s know-how with an important R&D program. The consolidated turnover in 2010 is poised to exceed $ 8 million Euros, or a growth rate of 25%; 54% of which was obtained through exports, with a presence that was increasingly significant in the public swimming-pool sector, especially in the US. Also, the Water division, a player in the international market, based in Montpellier, is a major national and international venture in which Bio-UV is involved.